First, children will learn about how Native Americans give thanks to nature. I recommend using the book, "Giving Thanks: A Native American Good Morning Message" (available at amazon.com) to teach this--but you can use other resources as well if you don't have the book. I've also included a sample "Thank you" message in this packet. Next, show children their books. I've included instructions for brainstorming and writing about each page, a sample "Thank you" message, and student work samples. Finally, children will choose lined or unlined paper, and write about why they are thankful for nature. CCSS.ELA-Literacy.RL.K.7 ...Describe the relationship between illustrations and the story in which they appear ... Use my sample to illustrate this standard. Children will the create writing that matches the illustrations. CCSS.ELA-Literacy.RL.K.10 Actively engage in group reading activities with purpose and understanding ... Display my sample book to teach this standard--And ask children to read their writing aloud when they complete their projects! CCSS.ELA-Literacy.RF.K.1a Follow words from left to right, top to bottom, and page by page. ... Children will learn this standard as they read my sample, and as they read their own finished work. CCSS.ELA-Literacy.RF.K.1b Recognize that spoken words are represented in written language by a specific sequences of letters. CCSS.ELA-Literacy.RF.K.1c Understand that words are separated by spaces in print. CCSS.ELA-Literacy.RF.K.2 Demonstrate understanding of spoken words, syllables, and sounds (phonemes) ... Discuss this standard as children write about why they are thankful. CCSS.ELA-Literacy.RF.K.4 Read emergent-reader texts with purpose and understanding ... Use my Thanksgiving sample and children's own work to teach this standard. CCSS.ELA-Literacy.L.K.1b Use frequently occurring nouns and verbs ... Discuss parts of speech as children write their own Thanksgiving books. CCSS.ELA-Literacy.L.K.2a Capitalize the first word in a sentence and the pronoun I.
CCSS.ELA-Literacy.L.K.2b Recognize and name end punctuation. CCSS.ELA-Literacy.L.K.2c Write a letter or letters for most consonant and short-vowel sounds ... Discuss letter sounds as children read and write Thanksgiving books. CCSS.ELA-Literacy.L.K.2d Spell simple words phonetically, drawing on knowledge of sound-letter relationships ... 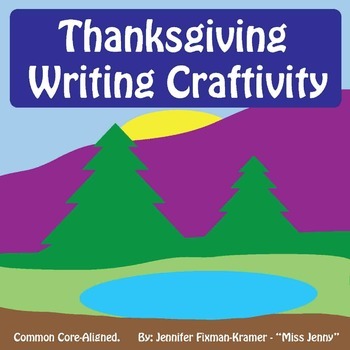 Discuss letter-sound relationships as children read and write Thanksgiving books. 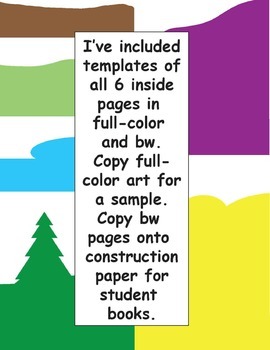 CCSS.ELA-Literacy.RF.1.1 Demonstrate understanding of the organization and basic features of print ... Discuss features of print while reading and writing about being thankful. CCSS.ELA-Literacy.RF.1.1a Recognize the distinguishing features of a sentence ... Discuss these features as children read and write being thankful. CCSS.ELA-Literacy.RF.1.3g Recognize and read grade-appropriate irregularly spelled words ... After reading my sample, say, "What do you notice?" Encourage children to point out interesting spellings. 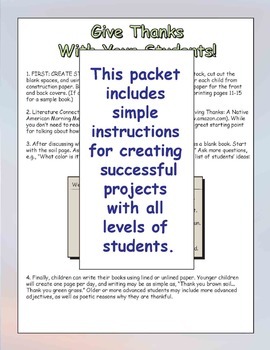 CCSS.ELA-Literacy.RF.1.4 Read with sufficient accuracy and fluency to support comprehension ... Repeated reading of familiar texts is the best way to teach this standard. Children will want to read their new Thanksgiving books over and over! CCSS.ELA-Literacy.RF.1.4a Read grade-level text with purpose and understanding ... Children will write at their own levels. Encourage children to use high-level language as you brainstorm. CCSS.ELA-Literacy.L.1.2d Use conventional spelling for words with common spelling patterns and for frequently occurring irregular words ... As you read the Thanksgiving books, ask children, "What do you notice?" Encourage them to point out interesting spellings, and discuss those patterns. CCSS.ELA-Literacy.RF.2.3 Know and apply grade-level phonics and word analysis skills in decoding words ... As you read my Thanksgiving sample and student books, ask children, "What do you notice?" Encourage them to point out interesting spellings. Use this as an opportunity to discuss spelling patterns. CCSS.ELA-Literacy.RF.2.4 Read with sufficient accuracy and fluency to support comprehension ... Repeated reading of familiar texts is the best way to teach this standard. Children will want to read their new creations over and over. CCSS.ELA-Literacy.L.3.1a Explain the function of nouns, pronouns, verbs, adjectives, and adverbs in general and their functions in particular sentences ... Discuss parts of speech as students brainstorm. 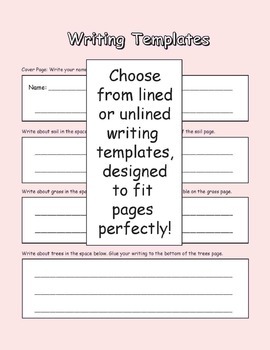 CCSS.ELA-Literacy.L.3.1i Produce simple, compound, and complex sentences ... Discuss types of sentences during the brainstorming process. CCSS.ELA-Literacy.L.3.2a Capitalize appropriate words in titles. CCSS.ELA-Literacy.L.3.3a Choose words and phrases for effect ... Third graders will be able to write more poetic versions of this book. CCSS.ELA-Literacy.L.3.5 Demonstrate understanding of figurative language, word relationships and nuances in word meanings ... Children are using personification as they tell about what each aspect of nature does for us. Encourage the use of figurative language as children write their own ideas. missjenny@edutunes.com, and I will do anything & everything I can to make things good ... From editing the product, to giving you a 100% refund. Thanks for your interest in my Thanksgiving Writing Craftivity. ***You may also be interested in my lower-prep 100-Page Thanksgiving K-1 FUN Math + Literacy + Crafts packet...Click here to try it!